The One. The Only. RIC FLAIR! Over the last weekend I had the chance to meet one of my personal heroes, The Nature Boy Ric Flair. He was making a personal appearance at a RV dealership located about fifteen minutes from my house. I just happen to be scrolling through Facebook when I saw a video titled “Ric Flair is Coming to Cleburne, Texas” so naturally I watched the ad. It was a leathered looking Ric Flair informing everyone that he would be making a personal appearance at some kind of RV sale. The thing was Ric wasn’t looking so hot and seemed to be slurring his lines. I’m not sure if the video was shot after a long day of work negotiating with the dealership in the hot sun (selfie style) or if the sixteen time world champ wasn't doing so well. So I immediately hit up the boys and to see if they were game for meeting the champ. After a hearty “Hell yeah” from the boys we started planning our day. 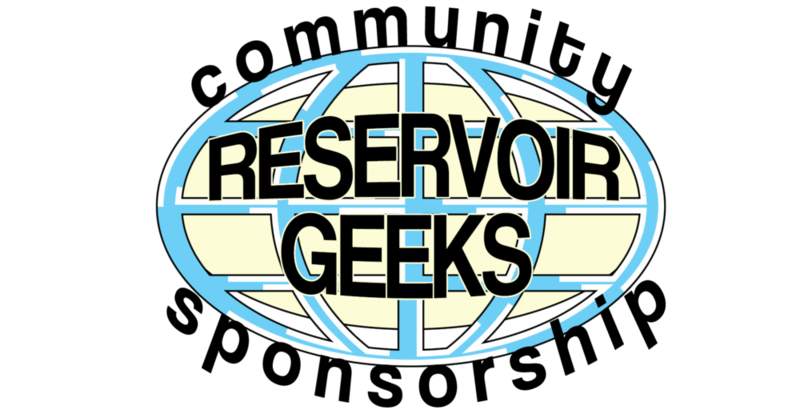 The appearance was scheduled for Three p.m. , and us be avid fans of comics and other nerdy fan based things knew this was going to draw a huge crowd. So we agreed to leave my house around 12:30 to make sure we were there early enough to get to see him. After a few minor delays we got to the dealership around 1:10 pm, and with us being around the Fiftieth in line we knew we secured our place to meet The Nature Boy. He was going to be signing and taking pictures inside their outdoor store but we weren't allowed in until 1:30. So, it being a hot summer day in Texas and a readily available snowcone vendor, I decided to take to boy for a couple of cones, my treat. After picking out what we wanted , a half tiger’s blood half orange for me and a blue raspberry for the boy, I asked how much I owed he informed me the dealership took care of it. So far off to a good start, free snowcones and a free chance to meet one of my childhood heroes! After devouring our cones and getting let into the building we began to enjoy the AC we realized there was more time to kill and they had activities for children. I took Steve to play the arcade game they had, to visit the balloon animal artist and got back in line with my friends. It was about thirty minutes 'til showtime and the crowd was starting to pile into this store, easily pushing around 500. Man, was I glad to be able to make it there when we did, Ric was only available for a two hour signing ,and some of these assholes were going home empty handed. As time grew nearer the crowd would let out random "WOOO"'s of anticipation and they began to become louder. Around 3:05 someone with a P.A. let us know that Ric’s plane was running late but he would be there within the next ten minutes. Sure enough like clockwork ten minutes later The Nature Boy made his grand appearance. He entered the building announced he was ready to sell some RVs and gave us a big "WOOO". At this point Steve was becoming nervous, and when i asked him why he informed me that he "has never met a world famous person before.” Well, before I could give him any other advice than “ he is just a man like you and me” it was our turn. I looked over at Steve and saw him clutching his WWE World Championship title belt to his chest and looking to me to lead the interaction. I handed my cell phone off to the employee of the RV dealership who was designated to take photos and stepped up to the table with Steve by my side. Ric Flair instantly extended is hand to mine for a handshake and was smiling, I introduced myself and Steve and let him know that Steve became a fan of him through me and that we were so excited to meet him. Ric replied back by asking how old Steve was and the he was so thankful for Steve being a fan. At this point Ric began signing Steve’s title belt (which he took his time with to make sure it was legible) and posed for our picture with him. After the photo opportunity i thanked him for everything he had done in his career and for keeping myself and Steve entertained to which he replied “No my man, thank you for being a fan” and waved bye to us. Steve and myself were floored at how nice and kind he was to us and my friends as well. People always say “don’t meet your heroes because they’ll let you down” well I’m here to inform you that it doesn’t always apply. Ric seemed like he was generally happy to meet us and wasn’t the least bit rude, which made it a fun time overall. 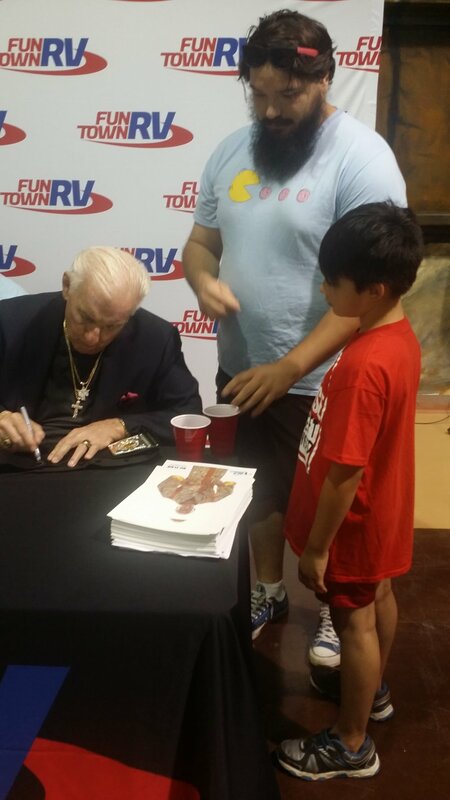 If you’re at a con of some sort or have a chance to meet The Nature Boy I highly recommend it. He won’t leave you disappointed. Posted on July 5, 2018 by Josh Brimhall and tagged WWE Celebrity.